Radin Skin Centre introduces ZO Medical by Zein Obagi MD. 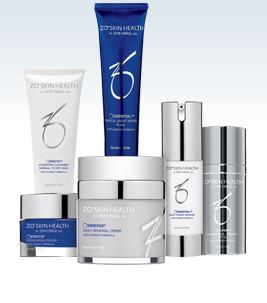 ZO Medical is a skin care line developed for specific concerns, such as Acne, hyperpigmentation, and irritated skin. Medical grade skin care is necessary to help combat medical skin conditions. ZO Medical will help you gain control of your skin conditions and maintain the results all the while improving the over all appearance of your skin. Radin Skin Centre introduces the highest standard of medical grade skin care! ZO Skin Health. Radin Skin Centre strongly believes in the importance of medical grade skin care, with better ingredients, longer lasting products, and visible results! Let us help you remodel your skin from home with a customized skin care plan. Call today to book your free skin care consultation. Radin Skin Centre provides Pro-Derm™ advanced skin care products to our patients. A pharmaceutical-grade skin care line that is only available from a dermatologist, Pro-Derm is based on the latest clinical research. Often called “cosmeceuticals,” these products are among the best skin care formulas available on the market today for restoring and maintaining your skin’s health and beauty. Pro-Derma Inc. was founded in Montreal and produces the Pro-Derm line. The company creates state-of-the-art formulas that are never tested on animals, and all products are perfume-free, paraben-free, alcohol-free, and mineral oil-free. Pro-Derm’s formulas improve a host of skin problems and provide aesthetic, anti-aging, and health benefits. The ingredients hydrate and soothe, and they include antioxidants and highly effective sunscreens to protect against sun damage. The quality of these products is exceptionally high, as they are made in small quantities, which allows for the optimization of the formulas. A proprietary natural vegetal base provides a protective layer for the skin, and many of the products are packaged in airless containers to preserve the integrity and stability of the botanical ingredients. Pro-Derm’s line contains products appropriate for oily skin and normal/combination skin, as well as dry and aging skin. The formulations protect against both internal and external factors that cause damage to the skin and the signs of aging. Cleansers, moisturizers, masques, and eye creams are part of the line, and some of the products are designed to help the skin heal after laser treatments, facial fillers, and other cosmetic procedures. Some of these products, such as Liftense™ LTL actually optimise the results of cosmetic procedures. Liftense contains one of the highest concentrations of peptides on the market. Another specialized product is Pro-Dermafiline – a firming body cream that reduces the appearance of cellulite. Hydrogel moisturizer, which contains plant and marine ingredients, is particularly soothing to sensitive skin. Pro-Derm’s skin lighteners help to reduce the appearance of hyperpigmentation. These are just a few of the products available, which can be used independently or as a complement to one of the treatments offered at Radin Skin Centre. After evaluating your skin, we will recommend the best products to help you maintain a healthy, youthful appearance. Contact us today about Pro-Derm Skin Care Products in Tecumseh / Windsor, Ontario.